Countesswells is embarking on the latest phase of its masterplan for a north east New Town built from scratch by advertising for commercial tenants to inhabit its developing town centre following completion of the first 200 homes. In order to provide amenities for its growing populace retail and commercial tenants are being sought to set up shop, diversifying a community which will number 3,000 homes over the coming decade, including parkland, three schools and community facilities. 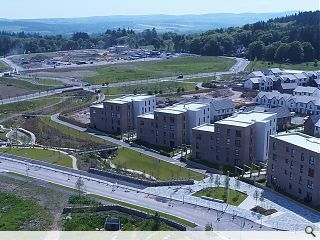 Jim Fitzsimons, director of special projects at Stewart Milne Group, said: “Our ambition is to create a new community which becomes a highly sought-after place for people to live, work and play. With the announcement that plans for first school are underway and now local retail opportunities, the pieces of the jigsaw are starting to come together as planned. A further 800 homes are currently under construction by four housebuilders; Stewart Milne, Kirkwood, Barratt and Chap. PR team must be working overtime on this -- 10 mentions of this development in UR over the part 5 years. When the first resident opens their first can of beans will UR report this momentous occasion? The Livingston/Cumbernauld of the north! Why oh why are we building new towns? Surely to hell it makes more sense to add to/improve the existing towns in the north east - there are plenty in need of regeneration! Is that a prison in the foreground. 4 lifeless blocks of undesigned nonsense. Which planner agreed that?